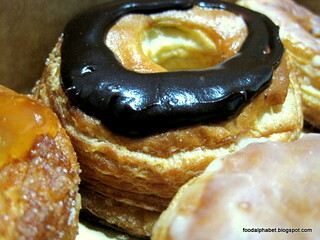 The Food Alphabet and More: Krispy Kroissant : Cronuts baked the Krispy Kreme way! 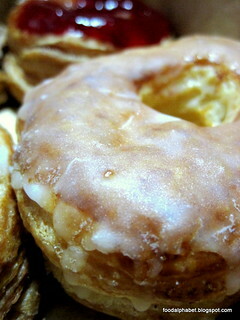 Krispy Kroissant : Cronuts baked the Krispy Kreme way! Once in a blue moon, a food craze sweeps the Philippines, remember the Shawarma days? I remember those days, where every corner you will see a Shawarma selling stall, and they just keep on popping up and just recently another food craze is making the Philippines go wild, the culprit "Cronuts". 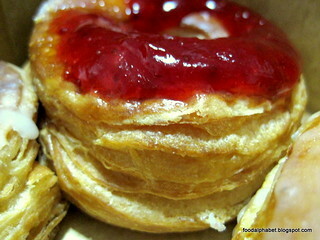 So what is a cronut, invented by a chef in the USA, it has found its way to many establishments here in the metro and everyone claiming their own version of the cornets it is either a hit or a miss, some are too oily, some are just too darn sweet but indeed it is hard to resist such a palatable idea, especially since it combines the subtle sweetness of croissants with the mouth-watering flavors of doughnuts. 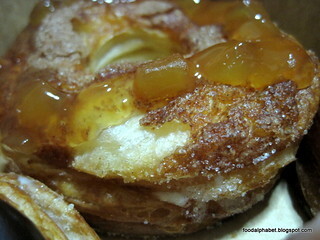 But to foodies who think they’re done with cronuts, and to all croissant and doughnut aficionados who are curious about what this delectable hybrid tastes like, just imagine layers of croissant goodness topped with delectable donut flavors. Ah I'm craving already. And now your favorite confectionery store Krispy Kreme is on the move to satisfy your cravings with sweet fares like this. Presenting Krispy Kroissant! Starting this August 15, Krispy Kreme branches all over Luzon will offer its very own version of this half-doughnut, half-croissant delight, which comes in the name of Krispy Kroissant. This must-try addition to the brand’s Baked Creations line not only boasts of four variants, but is also thoughtfully baked with Krispy Kreme’s expertise—hence, this newest offering is truly set to take your cronut experience up a notch. Those who are into the aromatic taste of cinnamon and the delicate sweetness of apples will surely enjoy Krispy Kroissant in Apple Cinnamon flavor. Mixed with caramelized cinnamon sugar, this treat is made even more delectable, as it is topped with a serving of apple cinammon. Meanwhile, chocolate lovers can feast on the luscious smack of the offeringChocolate, as this baked treat is specially topped with Belgian chocolate ganache. One will never get enough of the sweet tangy taste that comes with the Strawberry variant, for it is filled with a rich whip of strawberry. But for those who are into the simplistic yet inimitable flavors that come in Krispy Kreme’s doughs, Vanilla Cream, which is dipped in sugar glaze, is definitely the perfect cronut to go. All smothered in Krispy Kreme’s flavorful mixes, rolled in granulated sugar, filled with pastry cream, and topped with select ingredients, Krispy Kreme’s Krispy Kroissant will surely be an ideal choice for breakfast, snack, and even as a treat at night. So don’t forget to grab a box or two to further enjoy your Krispy Kroissant experience, because Krispy Kreme treats becomes extra-special treats when you share them with your loved ones. 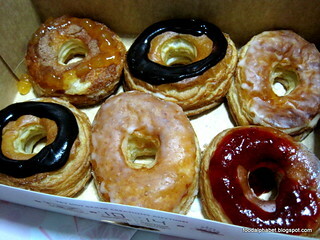 Go to your nearest Krispy Kreme store and take home a box of these Krispy Kreme baked creations, the Krispy Kroissant. Please be reminded though that these treats are baked daily from 10am - 2pm only, so if you are to visit quite late in the afternoon they might run out as well. 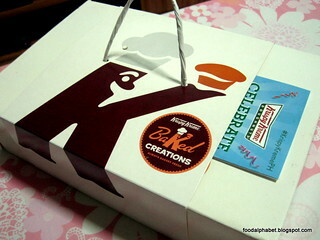 Visit Krispy Kreme Philippines on Facebook to know more.